JA Hill & TG Gillette (UT Southwestern Medical Center, USA), S Davison & D Yellon (Hatter Cardiovascular Institute, UCL, London, UK), H Li (Wuham University, China), San Martín (Emory University, USA), D Westenbrink (University of Groningen, The Netherlands). JA Hill & TG Gillette (UT Southwestern Medical Center, USA), D Westenbrink (University of Groningen, The Netherlands), Marta Sitges (Hospital Clínic, Barcelona, Spain). V Perez (Linus Pauling Institute, USA), C Solomon (University Queensland, Australia), C Rovira (University Lund, Sweden), Pascal Schneider (University Lausanne, Switzerland), Wael Rifa'i (University Miami, USA), Chris Abneter (NCI, USA). W El-Rifai (University Miami, USA), L Carvajal-Carmona (UC-Davis, USA), C Rabkin (NCI, USA). J Koshiol & To Hildesheim (NCI/USA), N Salama (Fred Hutchinson Cancer Research Center), M Levine (University of Maryland, USA), Christian Abnet & Constanza Camargo (NCI/NIH USA). 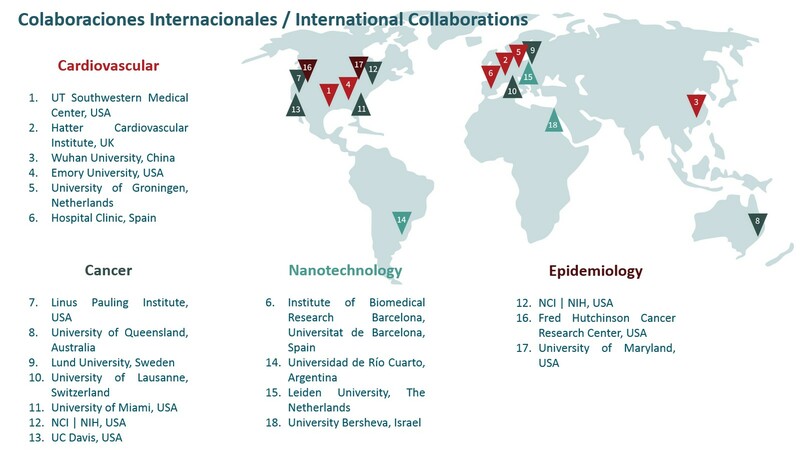 E Giralt (Institute of Biomedical Research Barcelona, Spain), F Albericio (University of Barcelona, Spain), J Samitier (Institute of Bioengineering of Catalonia, IBEC, Barcelona), GA Rivas, (University of Cordova, Argentina), LJ Cruz (University of Leiden, The Netherlands).